In science fiction literature circles, there is a long-running debate. Hollywood NEVER gets science fiction right. Directors and producers always settle for the lowest common denominator pulp junk – space battles, bug-eyed monsters, etc. while ignoring the rich history of the literature of ideas. There’s another equally passionate argument that numerous science fiction movies, including the blockbuster Star Wars saga, have been the gateway drug introducing film goers to science fiction and some small portion of that viewing audience later goes on to become numerous science fiction classic and contemporary short stories and novels. 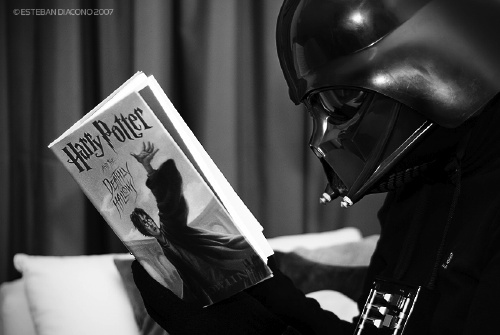 Hey, I had no idea Darth Vader is a Harry Potter fan. We’re not here to judge, padawan, and we don’t think anyone can realistically state that they’re right or wrong in this long-running debate (maybe Harlan Ellison can), but we didn’t want to fail to let you know about Star Wars Reads day on October 6. Star Wars has a long, rich history of media tie-in fiction spanning novels, graphic novels, comic books, eBooks, and lots more. Star Wars Reads day is organized by many publishers active in Star Wars publishing, including Abrams, Chronicle Books, Dark Horse, Del Rey, DK, Scholastic, Titan Magazines, and Workman. You can learn more at Star Wars Reads’ Facebook page. So, on October 6th, take a few minutes or few hours to read your favorite science fiction novel or short story – or favorite Star Wars novel. If you need some ideas on what to read, here are a few lists of science fiction novels to get your reading ASAP: 10 Science Fiction Books Every Physicist Should Read, 100 Science Fiction Novels to Geek Out Over, 5 Science Fiction Books Environmentalists Should Read. Do you love books, reading, bookstores and libraries as much as we do? Check out every single post we’ve ever published.